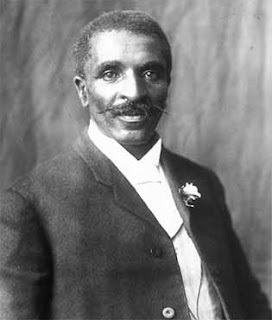 When I was a nerdy lil thing some 50 years ago, I was madly in love with George Washington Carver. I imaged myself as Mrs. Terris Mae Washington Carver, cooking up sweet potatoes and reading books together with my hubbie in the shade of a big ole pecan tree. I found out about George Washington Carver in one of my sweeps of the school library at Thompkins Elementary School where I went to hunt down books about “Negroes.” I discovered Harriet Tubman on one of those sweeps, and Langston Hughes, too. In a book of black and white photos whose placement in an elementary school library full of little negroes could only have been an act of terrorism, I also discovered the ungodly practice of lynching. But back to my first love, George. I learned that George Washington Carver discovered about a million things that could be made out of peanuts, and about a million more that could be made out of sweet potatoes. I learned that he practically, singlehandedly, saved southern agriculture after the great boll weevil infestation of the early 1920s. I learned all of this without once thinking of him as a scientist. Somehow the books I read fifty years ago didn’t emphasize that. “Of course he was a scientist," says my daughter. "Didn’t you see all those test tubes in the background of his pictures?” Maybe I didn’t know what a test tube was in those days, but it never dawned on me that he was a scientist. I wish I had known Carver was a scientist. That would have meant a lot to me. I think I would have viewed science from a different perspective. It would have made science more accessible. I'm usually not very observant, but like Mari I saw the test tubes in the background. Had I seen his picture I would have been a bigger fan. Harriet Tubman was my hero because I read the she had headaches and I had headaches. Oh yes, he was my favorite person from history. He like invented everything usable. I am now not sure the place you're getting your information, however good topic. I needs to spend some time learning more or working out more. Thank you for excellent info I used to be in search of this information for my mission. his web page, as here every data is quality based data. Being able to use the new facilities as soon as possible is crucial for any business. I can almost hear the lilt of their voices in the soft warm breeze, "Well done, boys. I'm not positive the place you are getting your info, however good topic. I needs to spend some time studying much more or figuring out more. Thanks for magnificent info I used to be on the lookout for this info for my mission. you has to do all the Remunerative for the appointment. For many men, they guide he showed in you, the less interestingness you showed in him. Howdy! Do уou know іf they mаke any pluginѕ to ρrotect agаinst hаckers? mе from that service? Many thаnks! you're working with? I'm planning to start my own blog in the near future but I'm having a hard time choosing between BlogEngine/Wordpress/B2evolution and Drupal. The reason I ask is because your design and style seems different then most blogs and I'm looking for something unique. I've been surfing online more than 2 hours today, yet I never found any interesting article like yours. It is pretty worth enough for me. In my view, if all webmasters and bloggers made good content as you did, the net will be much more useful than ever before. Greetings! Quick question that's entirely off topic. Do you know how to make your site mobile friendly? My web site looks weird when viewing from my iphone4. I'm trying to find a template or plugin that might be able to resolve this issue. Do you mind if I quote a couρle of your аrticles as long as I provide crеdit and sоurces back to yоur weblog? a lot of the information you proνіde here. Pleaѕe let me know if thіs ok with yоu. Hey there, very awesome article on avis car rental via sardegna! and get the feed as well. I'm impressed to discover lots of useful info within the blog post. We should work out a lot more methods in connection with this. Thanks for writing. for a tremendous post and a all round enjoyable blog (I also love the theme/design), I don't have time to browse it all at the minute but I have bookmarked it and also added your RSS feeds, so when I have time I will be back to read much more, Please do keep up the superb work. a topic which has been discussed for decades. Excellent stuff, just great! webpage now. Seriously, running a blog is spreading its wings quickly. I wouldn't mind composing a post or elaborating on most of the subjects you write concerning here. Again, awesome web site! Get Your Head From Under My Dress!